The vocal clusters dip ever so slightly into terrain of the Main Menu music from the game. Like the Firelink theme though, I'm trying to evoke a more intimate vibe, and this sense of something forlorn, of ancient and lost things. 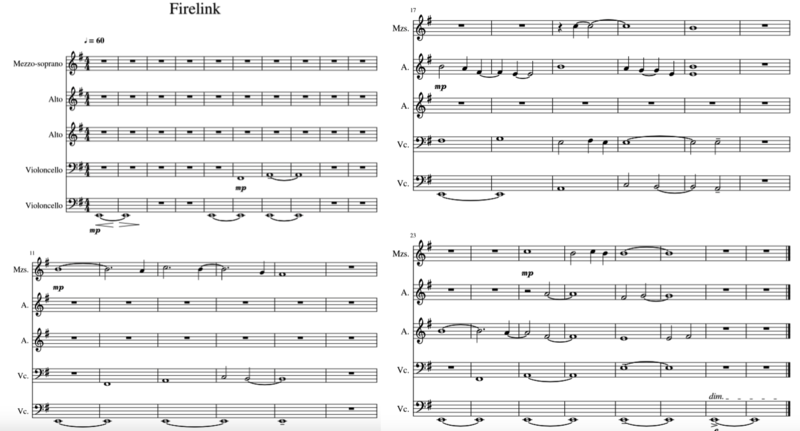 From closely listening to the original Firelink music, I noted its strong use of minor/aeolian in F, with an emphasis on the 2nd and 6th scale degrees. So I've tried to evoke a similar emotional experience (in E minor instead) with the cello climbing regularly to the 2nd then 4th scale degrees, the cello and voice both visiting the minor 6, and sharp dissonances of the vocal clusters like with the perfect fifth and minor sixth combined. So the plan is to record the cello first, the two parts layered onto each other, then head over to capture some "Ooos" from the singer to layer on top. The cello player just got back into town today, so recording will begin very soon. That's all for now! Check back soon for the Dark Souls pastiche and the demo reel.